The Major League Baseball Most Valuable Player Award (MVP) is an annual Major League Baseball (MLB) award given to one outstanding player in each league. Since 1931, it has been awarded by the Baseball Writers Association of America (BBWAA). The winner receives the Kenesaw Mountain Landis Memorial Baseball Award, which is named in honor of the first commissioner of MLB who served from 1920 to 1944. MVP voting takes place before the post-season but the results are not announced until after the World Series. The BBWAA began polling three writers in each league city in 1938, reducing that number to two per league city in 1961. 1923: The Yankees won the AL pennant again and the Giants once again captured the NL flag to set up the third-straight World Series matchup between the two teams. 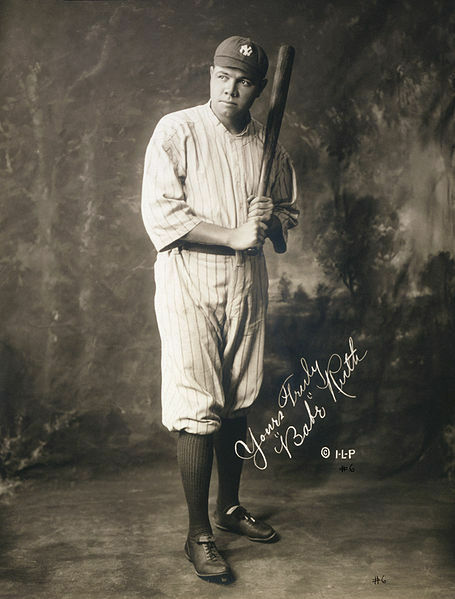 Babe Ruth responded, hitting .368 with 3 home runs in the series. In the regular season, Ruth led the American League with 41 home runs, was runnerup in batting average with .393 and was named the AL MVP. He also set a new AL record when he reached base a total of 379 time in the season. On April 18, Yankee Stadium opened and Ruth christened the new facility with a 3-run home run in the Yankees 4-1 victory over Boston.